Author: Lucie Green, Gherardo Valori, Francesco Zuccarello, Sarah Matthews at MSSL UCL, Sergei Zharkov at University of Hull and Salvo Guglielmino at Università degli Studi di Catania. Sunquakes are sporadic bursts of sound waves that are generated at the surface of the Sun as a side-effect of solar flares and coronal mass ejections. Sunquakes are thousands of times more energetic than the earthquakes seen on our planet and must be powered by a huge energy reservoir which is thought to come from the magnetic field in the solar atmosphere. But there is a mystery around how the energy released during a solar flare and a CME is transported from the atmosphere into the Sun and onto the epicentre that is the origin of the sunquake. While energy transport has been proposed to occur via particles, waves or a bulk motion of the magnetic field, no real explanation is available as to why sunquakes occur exactly where they do. With the launch of SDO we gained the opportunity to study the evolution of the corona in great detail in the time leading up to and during sunquakes, and relate this evolution to the generation of sunquakes. In this nugget we show the results of our investigation of the 3D magnetic field in the region of a sunquake that occurred on 17th February 2013. We show that a special configuration of the magnetic field may have focused energy onto a particular location in the lower atmosphere, thereby producing the sunquake . The sunquake of 17th February 2013 occurred in NOAA active region 11675. The evolution of this active region in the time leading up to the sunquake is dominated by the emergence of a series of magnetic bipoles with their associated motions, collision of polarities and, in one bipole, the splitting of the positive polarity. Collectively, this evolution creates a complex magnetic field configuration with regions of field that are highly sheared. On 17th February 2013, two rather modest flares were produced in quick succession. Both flares involve a highly sheared polarity inversion line (PIL). 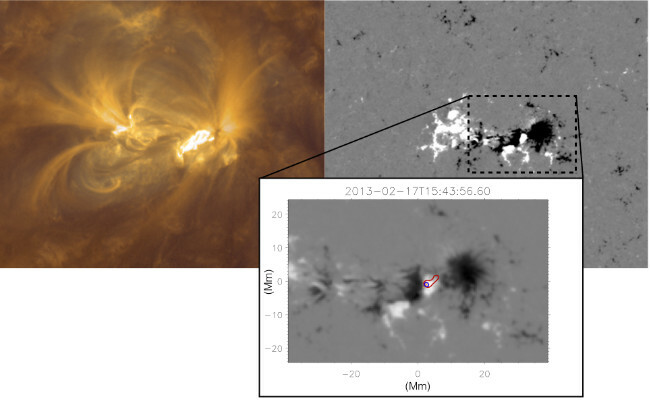 During the second flare (a GOES M1.9 class flare) an eruption was also produced. During the flare/eruption, the sunquake was detected in the positive magnetic field to the west of the highly sheared PIL. Figure 1 shows the location of the sunquake in the context of the coronal (SDO/AIA 171 Å and 304 Å wavebands) and magnetic field configuration (SDO/HMI line of sight data). The sunquake location is indicated on the HMI magnetogram by the red (6 mHz egression power) and blue (5 mHz egression power) contours. Figure 1. A composite AIA 304/171 image (left) showing NOAA active region 11675 and a HMI line of sight magnetic field image (right). The inset shows the location of the sunquake by red (6 mHz egression power) and blue (5 mHz egression power) contours. Magnetic field lines above the HFT (shown by orange field lines). These field lines correspond to an observed filament that erupted during the M-class flare. The filament location is shown in the upper left panel of Figure 2. A right-handed moderately twisted flux rope (shown by blue field lines) that is almost perpendicular to the polarity inversion line. Field lines that form an envelope surrounding the flux rope, which are essentially perpendicular to its central section (shown by green field lines). Figure 2. AIA and HMI images of the sunquake region (left column) showing the presence of a filament before the sunquake/flare/eruption. The right-hand panel shows the coronal magnetic field configuration just over one hour before the sunquake occurred. The yellow arrow indicates the relative viewing direction. 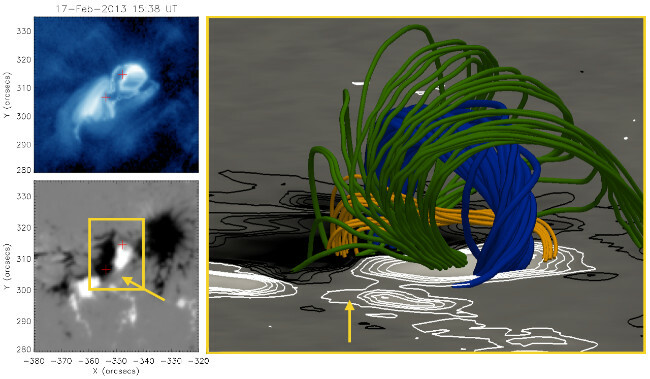 The NLFFF model combined with the SDO observations leads us to conclude that the reconnection site responsible for the energy release that is ultimately responsible for the sunquake is located all around the top of the flux rope. This reconnection is triggered by the expansion of the erupting flux rope and its associated filament, liberating energy along the green field lines shown in Figure 2. Our investigation supports the idea that in this event the sunquake’s occurrence and location are strongly influenced by the magnetic field configuration. The magnetic field appears to act as a “lens”, focusing the released energy on to a particular site in the lower atmosphere. We have modelled with unprecedented detail the local magnetic environment in which the sunquake occurs, which can be then further used to test the available physical mechanisms that generated the energy transfer powering the sunquake. The magnetic field configuration is relevant to both wave and particle sunquake mechanisms, as the magnetic field acts as a guide for both. Such a particular magnetic lens configuration, as found in active region 11675, may not always be present in solar flare magnetic fields, which could explain the erratic nature of sunquake occurrence. Green, L. M., Valori, G., Zuccarello, F. P., Zharkov, S., Matthews, S. A., Guglielmino, S. L., The 2013 February 17 Sunquake in the Context of the Active Region’s Magnetic Field Configuration, 2017ApJ. 849, 40. G. Valori, B. Kliem, T. Török, and V. S. Titov. Testing magnetofrictional extrapolation with the Titov-Démoulin model of solar active regions. A&A, 519, 2010.